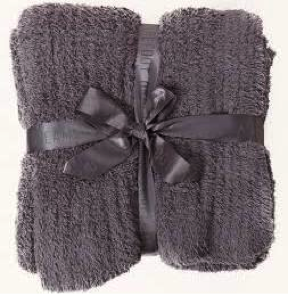 Let’s face it – gift giving can be a stressful task to take on, particularly for weddings. The elusive “perfect” gift is one that is meaningful, functional and unique. As spring and summer wedding invitations start to add pops of color to the standard array of winter electric bills, it has become evident that wedding season is right around the corner. Feeling stumped myself about finding inspiration for unique wedding gifts for friends, I decided to call on the Hoboken gift expert, Meghan Lavelle, owner of Washington General Store located in Hoboken, New Jersey. Meghan was kind enough to share her recommendations on sourcing unique gifts for discerning brides. 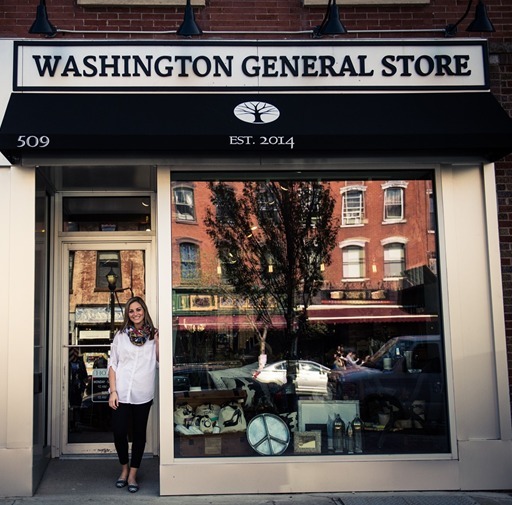 Tell us a little bit about Washington General Store and what drove you to open up a brick-and-mortar store in Hoboken! A Hoboken resident (and admitted last minute shopper), I created Washington General Store from my own gift giving needs. I come from a small town where shopping the local Main Street was the norm, and there were a few great gift shops there that really inspired my business. I love to shop locally for the support of the community and the convenience, but I always struggled to find unique and thoughtful gifts. Like much of Hoboken, I’m around the age where housewarmings, bridal showers and new babies occupy my social calendar and it occurred to me that I couldn’t be the only one in search of great gifts. So I took the biggest risk of my life and said goodbye to my career in luxury fashion and opened my dream store. I wanted to create a store that serviced everyone’s budget and offered my fellow “Hobokenites” unique, local products and outstanding customer service without breaking the bank. I often refer to my business as a “Labor of Love” because it was literally built from the ground up with the help of family and friends and is now supported by a community I love so much. What is the recommended amount to spend on a wedding gift? Is there a “magic” dollar amount or does it depend on the gift and relationship to the recipient? Sometimes I think that people over think wedding gifts. We live in an area where people often think the gift amount should cover the cost of their plate, and sometimes that can be a good rule of thumb, but you should always consider your personal budgetary limits. If the couple decides to host a lavish affair, it doesn’t mean you should go broke. A very personalized gift that speaks to them as a couple is always a good alternative. If I am bringing a date that the bride and groom have only met a few times, what is the best practice for gift giving? Regardless of how many times the couple has met your date, a gift from the two of you is proper. If the bride and groom give you the courtesy of bringing a date, you should reciprocate with a gift from you as a couple. If I am unable to attend the wedding should I still send a gift? If so, what recommendations do you have? Absolutely. If you think of what a wedding is really about, it’s to celebrate a couple on the most important day of their lives. Regardless of whether or not you can attend, you should want to give a token to the bride and groom that expresses your happiness for them and your well wishes as they begin their life together. Is it better to shop a bride and groom’s registry or come up with unique gifts? Depends. I usually like to do a combination of a personalized gift that I chose for them and an item off the registry. This way you know they are gifting something they need plus something meaningful from you personally. Although it’s intended to make it easier, sometimes registries can complicate things (i.e. when there is hardly anything left or just bits and pieces that don’t make sense). In this case, I always search out my own gift. Don’t force it with a registry. If there isn’t a suitable gift on there, then get creative (and include a gift receipt!). What are some atypical gifts for a bride and groom who already seem to have everything? 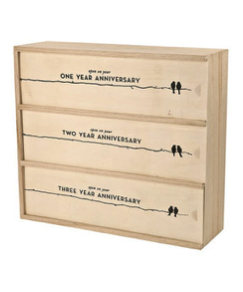 One of my favorite gifts to give is our Newlywed Anniversary Wine Box. Any couple I’ve given this to has told me it was their favorite wedding gift (which always makes me proud!). There are 3 compartments in the box: 1st Anniversary, 2nd Anniversary & 3rd Anniversary. The idea is that the couple drinks the bottle in the appropriate compartment on their anniversary. I usually put a nice bottle of champagne in the first, a bottle of red wine in the second and a bottle of tequila in the third. Makes for a great gift you KNOW they will use and provides some laughs! If you are invited to attend the Engagement Party, Bridal Shower, Bachelorette Party and Wedding, what is the proper amount to spend on gifts and do you need to provide a gift for each separate wedding event? Men have no idea how easy they have it, right?! Most likely, if you’re involved in all of these events, it’s because you’re a close friend or family member and the bride really wants you to share in her big day. Spend what YOU are comfortable spending – the part that matters most is that you were there. 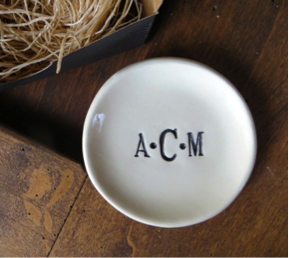 I usually give a small engagement gift to the bride, like a ring dish with her new monogram, and a small token to the bride and groom as a couple. I’m not one for Bachelorette Party gifts, but I do think shower and wedding gifts are a must. The most important part of wedding gifts actually rests in the bride and groom’s hands – the “thank you” note! What are some best practices for crafting and sending wedding thank you notes? In your opinion, how long is too long to wait to send thank you notes? If I’m being very honest, I think the more time that passes, the less genuine the thank you seems. I know that often time people wait to get photos back before sending thank you notes, but if that means it takes months to thank your guests, it just isn’t worth it! If you do send thank you notes with a photo, make sure you write a note to each person. I’ve received general “Thank You” photos with nothing written on them and, I admit, it felt very insincere. 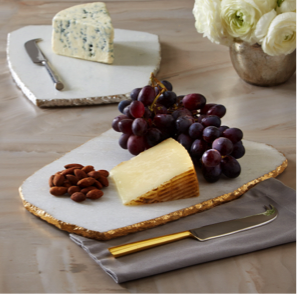 What are some of your top picks for wedding gifts from Washington General Store? *I love giving this as an engagement gift because it’s usually the first time a bride sees her new monogram! 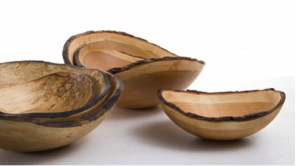 *Each bowl is hand carved and finished so that is it food safe. I love that the artist only uses fallen trees to create his bowls and each one is signed on the bottom. 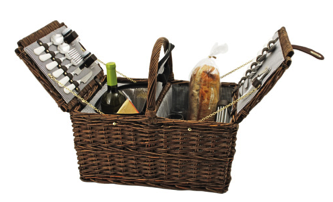 *The set for 4 contains everything for the perfect picnic. The insulated compartment will keep food or drinks hot or cold for hours. Great for a date night on the pier in Hoboken! *These are really quality marble slabs offered with gold or silver tipping. Perfect for the modern couple! 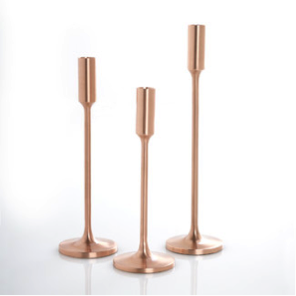 *Super chic in the rose gold colorway! *You cannot even imagine how soft this throw is! *New version is arriving at the end of the month! How can brides (and guests) shop at Washington General Store? We are hoping to launch our e-commerce store this Spring – stay tuned! You can find us on Facebook, Instagram and Twitter!